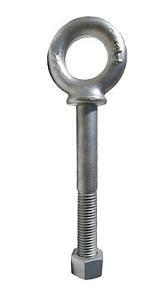 PRODUCT: #NSP384 FORGED-STEEL SHOULDER EYE BOLT WITH NUT. Price/ 50. Nut Eye Bolts not recommended for lifting applications. See Machinery Lifting Eye Bolts for lifting applications. "Rated Capacity" refers to a straight, zero degree, pull. Pulling at an angle can reduce the rated capacity significantly. We can produce Eye Bolts in lengths other than that shown in all diameters up to 12" in length. 1/4" Eye Bolts beyond 12" lengths and diameters 1 1/2" are produced as "Specials". Please contact us for quote.